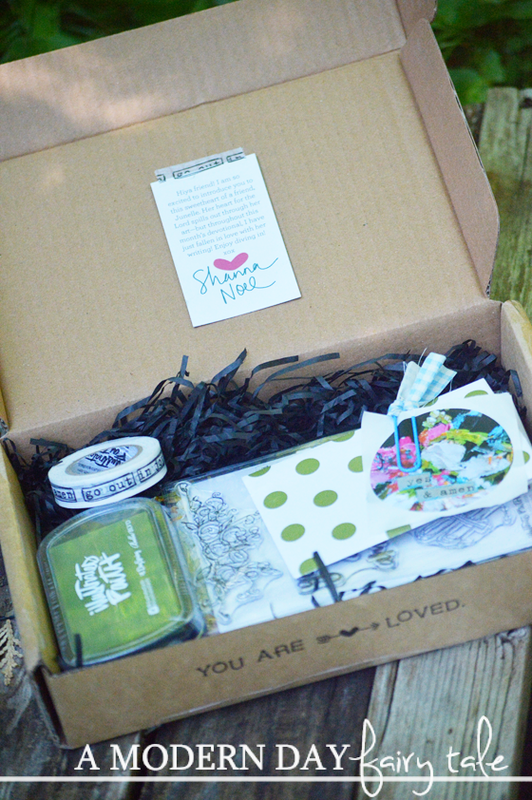 **As a member on the Illustrated Faith Launch Team, I received this kit in consideration for this post. All thoughts are 100% my own. Post contains affiliate links. Looks pretty amazing, right? But perhaps you're looking at this and maybe you even watched my unboxing video for this kit and thought to yourself, 'Yes, that looks great...but how do I actually use the items in my kit?' 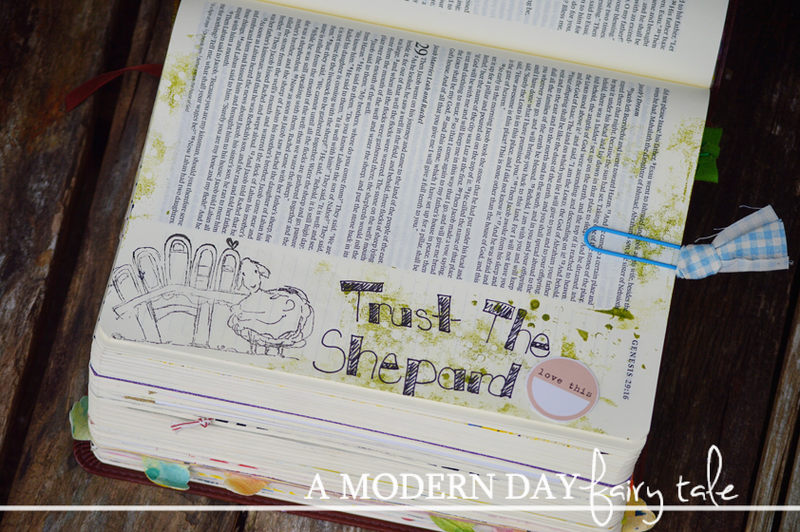 Maybe you're new to Bible journaling and aren't sure where to begin or maybe you just need a little extra inspiration... so today, I'm here to help! 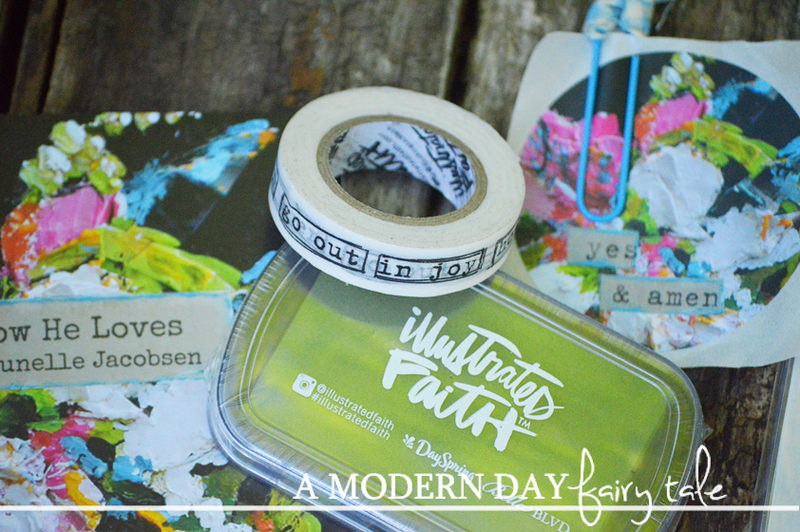 I'm sharing my Top 7 favorite uses of the items in these monthly devotional kits! I'll be focusing on this month's Yes & Amen kit, but you'll find many of these may stay the same throughout each month. You want to know the really cool thing about these kits and devotionals? While they are perfectly designed to be used together and can be the perfect starting point for all your journaling entries, you can also incorporate any other craft supplies you might have too. When I opened Day 1 of the How He Loves devotional, I was immediately struck by one phrase, "Good morning Jesus!". I loved this simple sentiment and knew I wanted to journal it. But, while I loved the colors and styles in this devotional kit, it's just not what I pictured in my head for this particular page. Instead I pictured bright colors, morning sunshine... so I went with that. 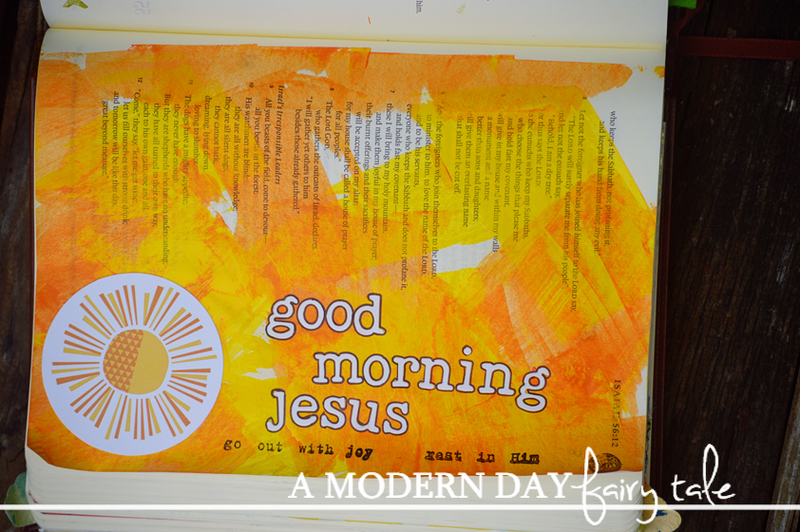 I used the phrase from the devotional as my inspiration but used a die cut and letter stickers from other Illustrated Faith collections. The stamps from the kit then tied it in. But whether you use anything from the kit on each page, don't feel confined to these supplies and these color choices only. Take these words as inspiration, but make them your own. What are tip-ins, you ask? I wondered the same when I first started this journaling journey. 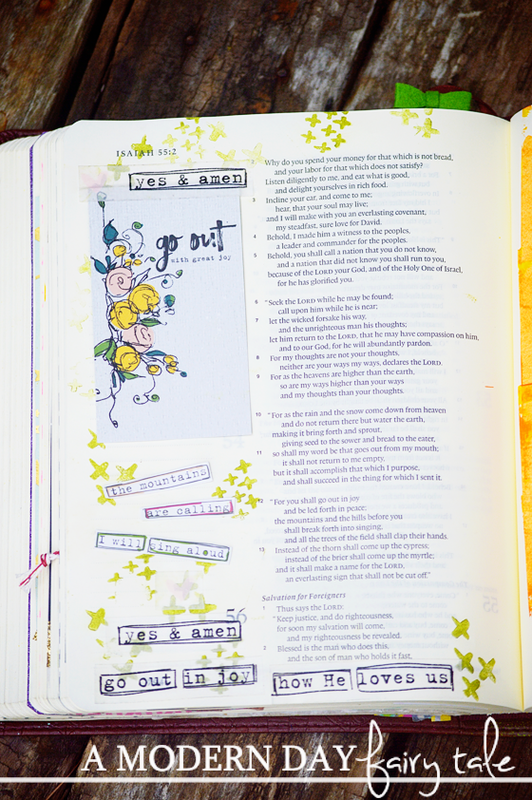 Simply put, tips are anything that can be taped into your Bible or journal that can be flipped open or up to reveal nots or even more artwork underneath. 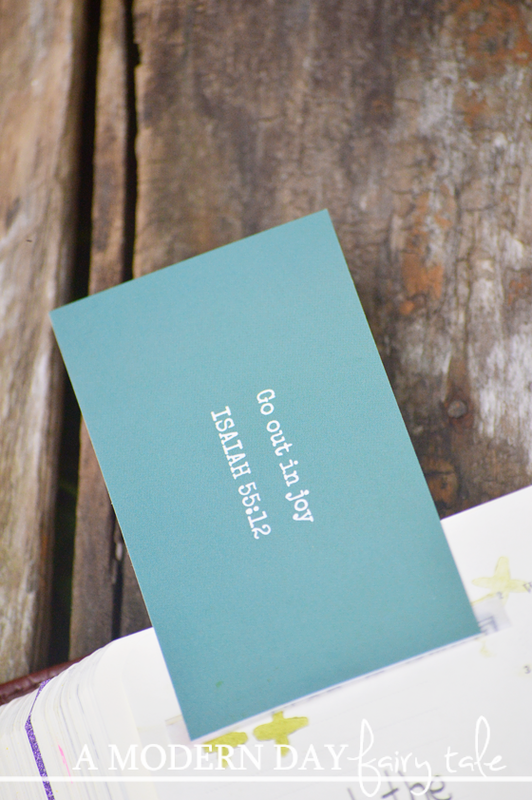 The scripture cards included in each kit are wonderful for this. Simply use your included washi and tape the top or side to give you the look you want. 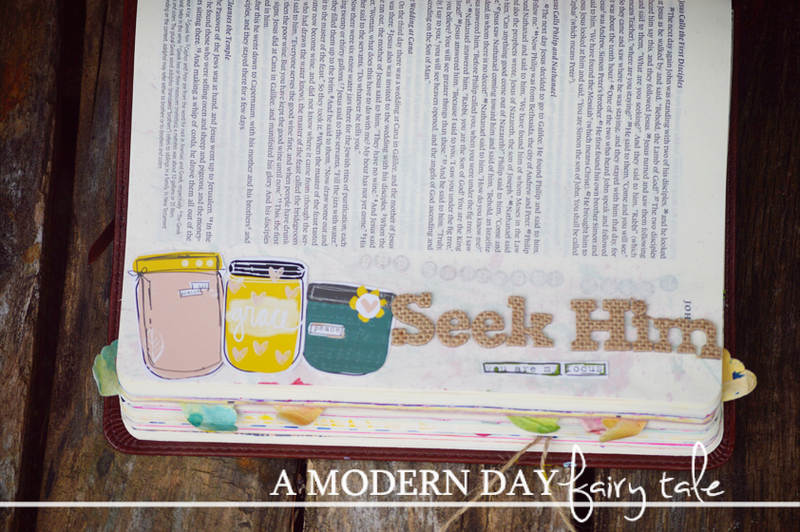 I personally love sharing photos of my Bible journaling and allowing others to look through my Bible as they wish... but perhaps a verse strikes you and you want to get a little more personal. This allows you to do so. And because washi is so easily removed, you can even tape more than one side for added privacy if you prefer. Personally, there is just something about journaling IN my Bible that is really quite calming for me. I love seeing the Word right there intertwined with my journaling. I was never of the opinion that a Bible is to be left unmarked or unhighlighted, etc but rather that a Bible is to be used... and that it was a GOOD sign when your Bible is falling apart. But that's not everyone. Some people just are not comfortable marking in their Bible...and you know what? That's okay! These kits can still be beneficial. Instead considering starting a seperate faith journal...or journal right in the devotional...there is space for you to do so. Or use the supplies in other areas of crafting that interest you- scrapbooking, card making, even glam planning... they may be designed to be used with Bible journaling, but there truly are endless uses too. Did you know that I help co-admin a wonderful Bible journaling group on Facebook that is all about blessing others through Happy Mail? Well, I do. These wonderful ladies know that we all need a little something in our mailboxes on occasion aside from the same ol' bills and junks...and so they brighten each others days through prayers and through little bits of journaling supplies sent through the mail. It can be as simple as a card and a few scraps of paper, or as over the top as a box packed full of craft supplies. Again, these scripture cards are ideal. They offer a beautiful piece of encouragement and scripture that can truly brighten someone's day. It doesn't have to be a stranger in a happy mail group, maybe someone you know needs some extra prayers...toss it in an envelope with a sweet note and stick it in the mail, or keep these cards in your wallet and pass it along as you feel the need. It truly is such a simple thing, but truly can make a world of difference to someone suffering. I've said it once and I'll say it again...I'm no artist! I'm just not. God gave me many gifts to share, but drawing...well, it's just not one of them. For that reason stamps (and die cuts too!) 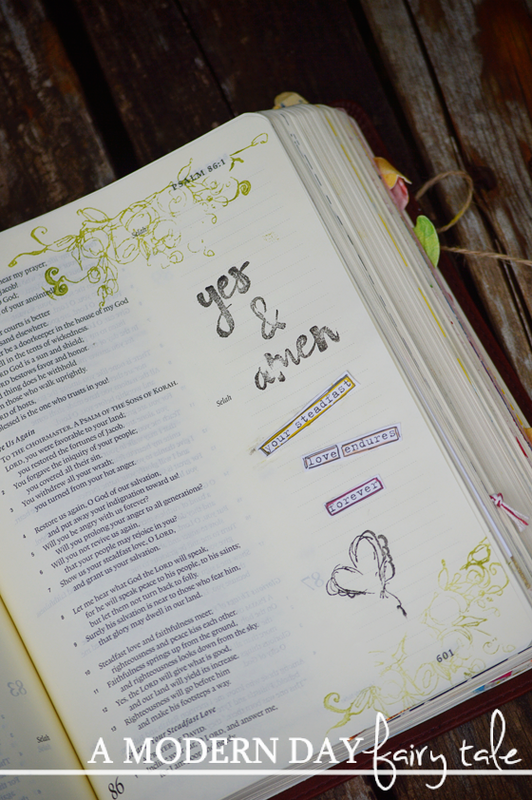 have been a wonderful addition to my Bible journaling. 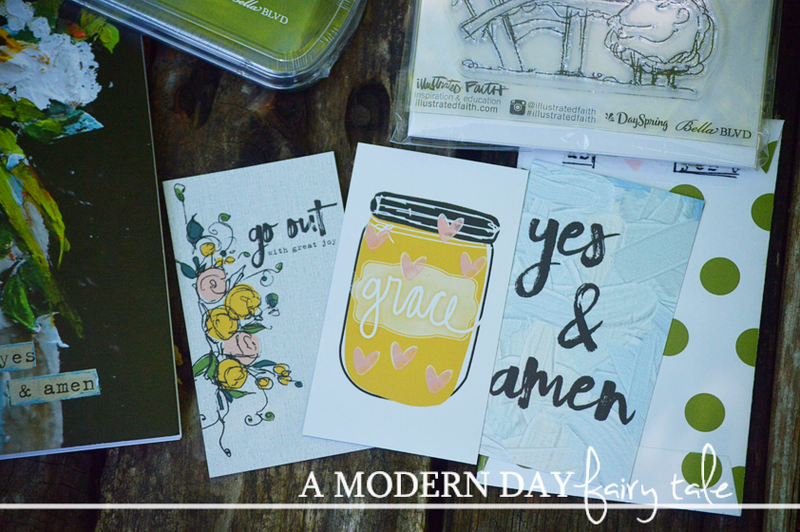 This is why these are probably some of my favorite things in these devotional kits---and for Bible journaling in general. They allow me to incorporate these beautiful images and words into my pages that I simply could not do on my own...so use them to do the same in your own journaling! 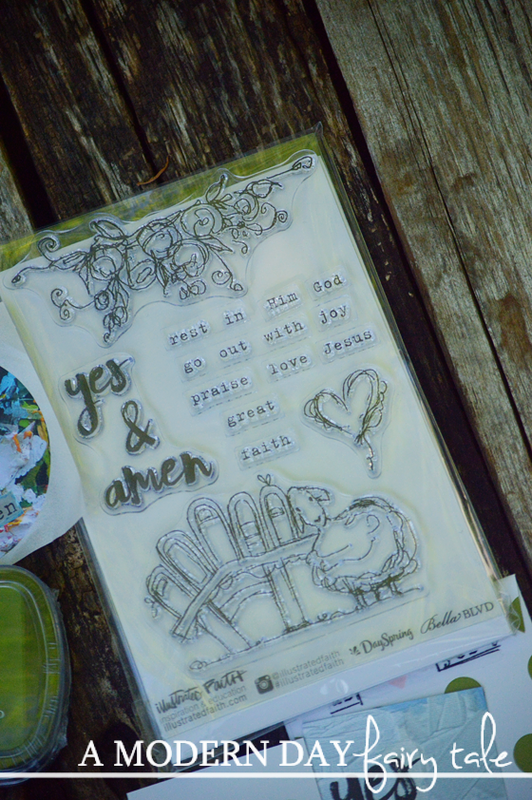 The stamps in these kits are ideal to go with the devotional, taking a lot of the guesswork out of just making them work (as so often happens with many stamps found at my local craft store). If you've seen my unboxing videos...or my my craft table...you know that I just love my washi! And Illustrated Faith washi tapes are among my favorites. And I'm not alone in my washi obsession. So what's the big deal? What is washi and how can you use it in your journaling? Well, if you hadn't figured it out already, washi is a decorative craft tape that is easy to remove and move. This makes it ideal for paper crafting projects. 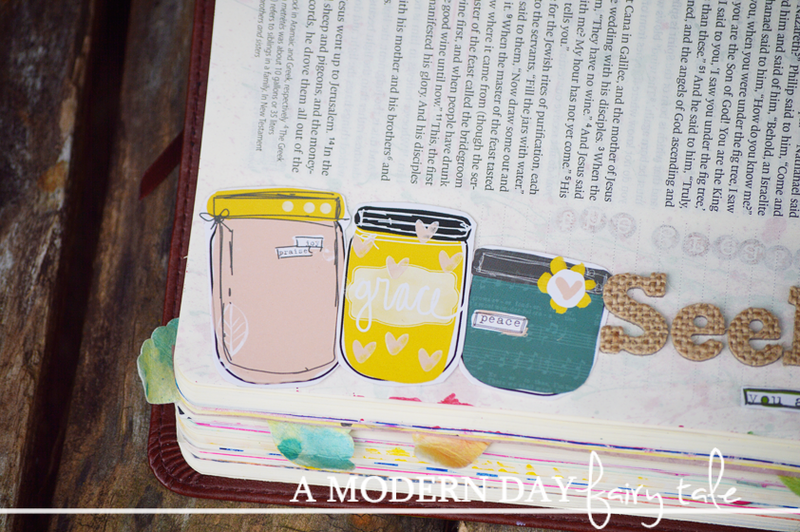 In Bible journaling, there are many ways to use washi. Many people washi the outside edge of the first page of every book in the Bible, making it easier to flip to. As mentioned earlier, washi is also used when creating tip ins. These are some more functional uses, but personally I just love using it to take my pages to they next level! They add a bit more variety and color... more fun!! If a page just seems like it needs a little something more... chances are washi will take care of it. 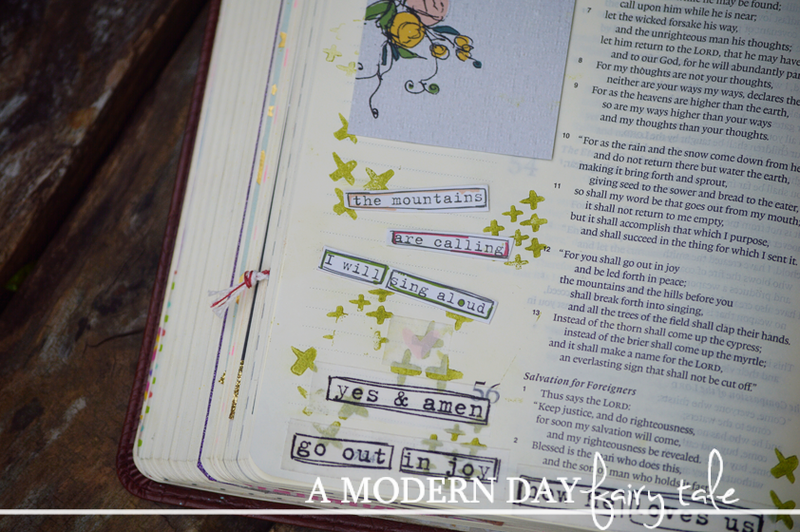 With the washi from this kit in particular, I love that it helps me to incorporate those themes talked about in the devotional into my journaling pages with these simple phrases. That's really what it's all about, isn't it? Whether we use these supplies in our journaling Bibles, the devotional or a plain ol' journal...whether we are fantastic artists or can barely draw a stick figure. Those details are insignificant. The best and only way to use the Illustrated Faith devotional kits is to strengthen our relationship with God. Each devotional is going to offer a little something different each month, but this one truly is the greatest reminder to make that time for the Lord. Stop, and tell him good morning. Stop, and think about how we can go out in joy in our days. Stop, and see the glory of God all around us in the details, in nature. Stop, and think about how he loves us. Stop, and think about what it means to be the sheep to Jesus our Shepard. Stop, go out in joy, have peace, know that you are loved and protected. I truly have enjoyed journaling my way through these devotional pages and cannot wait to see what next month has in store for us! The July kit is now available for purchase at Dayspring. Have you ordered your monthly kit? What are some of YOUR favorite ways to use the kit and the items inside? This looks so fun!! I love the stamp so much! I haven't done any thing like this in a long time. What a lovely set! I love the words of encouragement that it contains. This is such a unique idea! Love the creativity it inspires as well as the faith.